Through all the fun and anticipation of Easter - bunnies, chicks, chocolates, jellybeans & baskets are everywhere. They seem to take over the holiday. 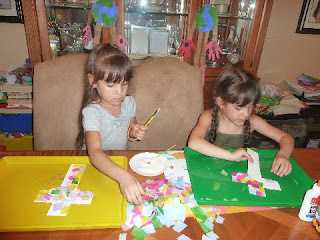 I like to take the time to talk to the Lil Divas about the reason we celebrate Easter - Jesus. They are still young and of course I do not want to tramautize them by over emphasizing the tragedy of the crucifixion but I strongly feel that they should be introduced to the story - just in a way they can digest it. Over Christmas we took the girls to watch their first Christmas Pageant and they saw the story of the crucifixion as part of it. They were talking about it for weeks and it really impacted them. Now that Easter is upon us - I have been re-introducing the idea planted during the Christmas Pageant & Holiday Season. All of these stories emphasize the story of Jesus - some are very simple and basic, the last one is a bit more detailed but even it glossed over the crucifixion so no need to worry. Do you have any good Easter book recommendations? 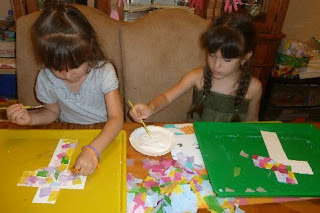 Now that the Lil Divas are getting a bit older for board books - they are fond of reffering to them as baby books these days - I am on the lookout for books that tell the Easter Story with a bit more detail but are still appropriate for their age group. If you have any suggestions please be sure to comment - thanks! 2. Cut out a cross template using the white paper. 3. 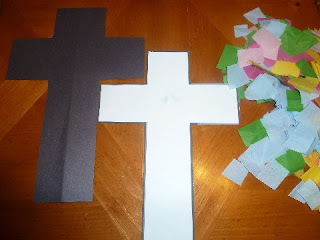 Cut out a larger sized cross out of the black paper. 4. Glue the tissue paper squares to the white cross - encourage covering all the white - even if it overlaps. If you look at the picture above of the 2 crosses you will see the one on the left looks alot better bc my oldest covered up all the paper - it looks really good in the window! 5. 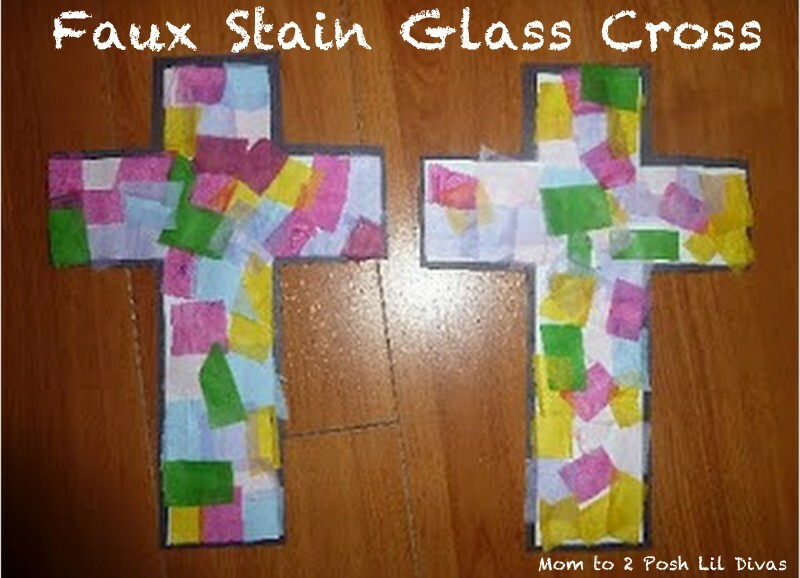 Glue the white cross on top of the larger black cross & behold your faux stain glass cross! 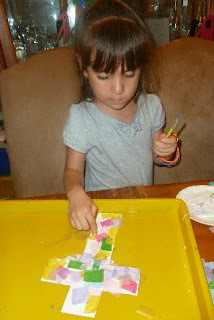 This was a simple craft that looks really﻿ cute displayed on our windows! How are you introducing and/or keeping Jesus in Easter with your family? What a great craft and book recommendations. 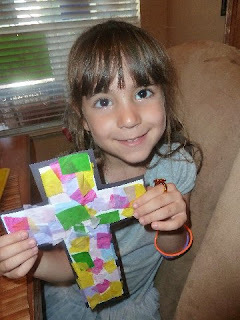 We're always on the lookout for good books that teach the kids about faith and I love easy crafts. Thanks for sharing! We decorated crosses with tissue paper too. It turned out to be a great craft for all of us. I miss those crafting with young children days...waiting for the grandkids...eventually. Found you on Sunday's hop! Aaah they turned out really lovely!!! And you little girl looks so pleased and adorable too! Great craft. I hope to instill in my daughter the importance of religion during the holiday seasons! You did a great job of this.